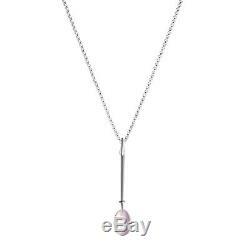 Sterling Silver Pendant with Rose Quartz #128 A - DEW DROP. Vivianna Torun Bülow-Hübe 1927 - 2004. Stamped with post 1945 Georg Jensen Hallmarks. Length: 4,4 cm / 1.7 inches. Chain 45 cm / 18 inches. Delivered in a Georg Jensen Gift box. Please note that the prices on our website are export prices. Sterling Silver Pendant with Rose Quartz #128A DEW DROP" is in sale since Friday, October 5, 2018. This item is in the category "Jewelry & Watches\Fashion Jewelry\Necklaces & Pendants". The seller is "silvergroupdenmark" and is located in Aarhus. This item can be shipped worldwide.